For sale on Samos; Villa Kambos, a B&B and a large family house beautifully situated in a rolling plain near the sea in an unique place! After 20 wonderful years here on Samos i decided to go for a more quiet life and i offer with pain in my heart this beautiful place. I hope to find new owners who will also put their heart and soul in it. 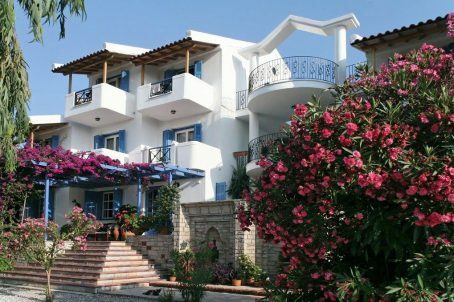 The very well maintained villa is located on the green northern coast of Samos, in the middle of a vast hiking area. The villa is build in Greek style and has 9 rooms and an apartment.All rooms have see- and mountainview. Via a gravel path the beach is only 5 minutes away. A stay in villa Kambos is both suitable for nature hiking enthusiasts as for beachgoers. There is a larg family house with 4 sleeping rooms , 2 bath rooms, central heating, a fire place and a large garage/store. In the summer from April till November different airlines fly directly on Samos. The villa stands on 1500 m2 of private land and is surrounded by gardens and terraces with orange and lemon trees. It has his own watersupply merely used for watering the gardens. Breakfast can be served in the reception/ breakfastplace but also in the garden under the almond trees.